Water flows from the American tunnel at the Gladstone Site into the top ponds, where Green Age Technologies pulls water from for their treatment process north of Silverton. The lower ponds hold water from the Gold King Mine before being treated and released into the creek. The state of Colorado will take over the expense of treating water next year around the Gold King Mine. Hardrock mining companies in Colorado may be required to demonstrate they can pay to treat polluted water and give a timeline for performing treatment before receiving permits, according to a bill approved by state lawmakers on Monday. If passed into law, a timeline for water treatment would provide a public glimpse of the environmental impacts of new hardrock mines, which can require decades of water treatment long after a mine has been shuttered. Currently, companies are not required to give an end date for treatment – they can, in theory, treat water for pollutants indefinitely. Western Slope residents, including La Plata County commissioners, public health officials, anglers and farmers, cheered the measure as a way ensure mine companies foot the bill for disasters like the Gold King Mine spill, which unleashed 3 million gallons of wastewater into the Animas River in 2015. 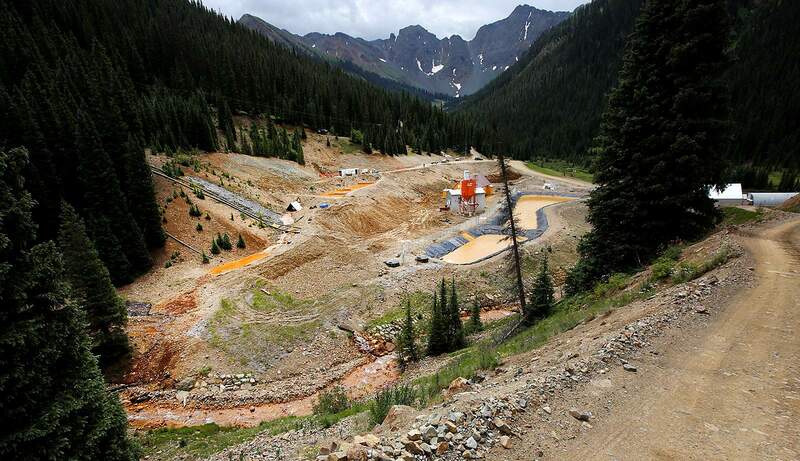 Colorado will not have to pay for water treatment related to the Gold King spill, but ongoing water treatment costs from another Superfund site, the Summitville mine south of Del Norte, will fall to the state in 2023. The Colorado Department of Public Health and Environment will pay $2.2 million a year for water treatment for Summitville. Mine company representatives cautiously supported the bill but were concerned the new requirements could affect financing for new mines. Lawmakers assured them the bill is not meant to deter hardrock mining, which remains a part of western Colorado’s economy. The bill passed the House Rural Affairs committee on a 7-4 vote, and it now heads to the House floor. Rep. Barbara McLachlan, D-Durango, and Rep. Dylan Roberts, D-Avon, both committee members, carried the bill for the second year. Rep. Marc Catlin, R-Montrose, also a committee member, voted against it. The law targets so-called hardrock mines, once the lifeblood of western Colorado communities that relied on gold, silver, iron ore and uranium deposits in the mountains. Many mines went unregulated for more than a century, and when they were abandoned, piles of waste were left to pollute the landscape. Colorado has 23,000 abandoned mines, according the Colorado Division of Reclamation, Mining and Safety. If passed into law, the bill will not affect abandoned mines like the Gold King, a long-shuttered 19th century mine whose cleanup was being overseen by the Environmental Protection Agency. But it would require operators of new mines to prove they can pay for water treatment in the event of a spill. The bill would also eliminate the practice of self-bonding – when a mine is allowed to submit a financial statement proving it can pay for any mishaps, like spills, that occur during reclamation. But self-bonding is risky – if a company goes out of business or files for bankruptcy, the cost of cleanup passes to taxpayers. Instead, the new law would require mines to provide outside insurance.